Live and Uncensored! 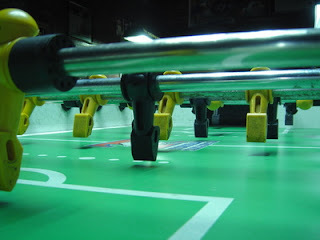 : Is There a Reason to Surrender the Foosball Table? Is There a Reason to Surrender the Foosball Table? Hot off the heels of Time naming YOU its Man of the Year, Advertising Age crowns The Consumer Agency of the Year. Looks like we've got a new rock star. You're hot. You're blowing up. Bask in those rays, then record your acceptance speech on YouTube. We won't just listen in total adoration; we'll even take notes. It's really great that the mistakenly-named Little Guy is finally getting kudos for being an assertive customer who wants to one-up Ad Man and Big Business, but now that consumers are doing all the work, what are advertisers doing? Handing over their jobs, that's what. Everybody from the NFL to Dove is conducting send-us-anything consumer ad contests, presenting their "win a :30 spot!" pitches in a way that's stripped itself of any professional or creative guise in order to pander. It's safe to say marketers are responding to the consumer-is-king backlash by fanning the flames, happily handing over the rights to their mini b-ball courts, paycheques and ... jobs. You've heard me mention before that you can really only be a great marketer if you know (or for those most lofty, remember) what it's like to be a consumer. I stand by that. I also maintain it's not news that the consumer has power - the consumer has always had power. From the beginning of the value dialogue, when mercantilism created scalable variety in the marketplace, people had the power to choose where to spend their money, and to relate feedback about the quality of our products and services to their friends. Web 2.0 merely enables today's consumer to wield these same powers in a way that finally shakes businesses so significantly they have to listen. And that's good, because these days some businesses can get so big they forget that they have customers to answer to, with specific needs and opinions of their own. Today a customer doesn't merely vote with financial capital; they can vote in critique, parody and even their own brand of investigative journalism, then reach an audience of thousands of sympathizers. That's incredible. And now they want to talk to marketers about marketing. In fact, some marketers appear to think they want to take marketing on completely. That's a dangerous line of thought, and it doesn't necessarily yield the best results. Even the NFL's sad plea for consumer-generated ads ultimately ended with an ad guy winning the pie. Big shocker? No, not really. The best marketers, like the best anything, have fallen in love with their profession. They can listen to the word on the street and engage it proactively without losing their own identities - and the identities of their brands - in the process. That's what makes them the best. We're creative professionals. We spent years studying demographic trends and trying to wield emotions with one line, one graphic, one life-changing product. It's our job to generate great ideas of our own that engenders feedback and incorporates it in some way. We're trying to have a conversation with a society, not a master/slave dynamic. That turns our brands into faceless entities with OBO written across their logos. Our customers, the people with whom we should have the most intimate relationship, are finally able to engage us in a two-way dialogue on a more even playing field - that's cause for celebration. But we've still got our own contributions to make to the big picture. We must still create work and generate interactivity in a way that's provocative and well-executed, because that is our job. Our customers aren't trying to replace us - they've got their own dreams to follow. They're asking us to tell a story we might be missing, one that might add value to the images of the products and services we represent. Marketing needs collaboration between creative professionals and the people they're trying to talk to. Because marketing is, at its lowest common denominator, a conversation about the customer and about the immediate world. It's a running dialogue about us. Don't trash your responsibility to your brands and society at large, letting whosoever wishes run the circus. We're trying to establish relationships here, not hand over the keys and the pink slip to the livelihoods we love. There's nothing lamer than trying to hold up a one-way conversation.